MAMEM makes available its first prototype application to support the interaction for its target user group of people with disabilities. GazeTheWeb prototype is designed to be used with eye-tracking device to support Web exploration without conventional keyboard-mouse input. 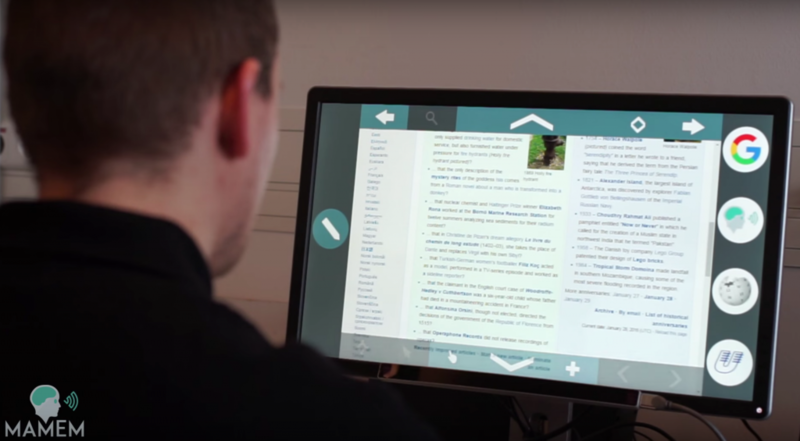 The current prototype allows you to browse, scroll, read, and navigate through Internet via gaze commands. It works swiftly using dwell time selection once you have your eye-tracking device installed. If you do not have an eye-tracking device you can use mouse as input source. GazeTheWeb prototype is based on the Chromium Embedded Framework (CEF) to support Web browsing environment with gaze. The chromium web browser engine is embedded with interface overlay implemented in C++11 and OpenGL. The overlay is also available as eyeGUI library to allow independent application development for interaction with the gaze input. Currently it works on Windows with Visual Studio 2015 as 32bit project or on Linux with GCC 5.x as 64bit project. The functionality of “GazeTheWeb” browser is demonstrated here. The prototype has been made available through GitHub and can be download here. Please check the wiki for more information about this prototype.